I have two Velez smocks, one from 2008 - a men's medium. And one I bought a few days ago - a lady's size S. The reason being, simply, 7 years ago the colours of the women's Páramo was so dire I opted for the men's black! Some time later, I've lost weight and wanted something a little more flattering. This time around I discovered that the colour "Heath" is quite pleasant, and so I became the owner of yet another piece of Páramo. So it turns out that Heath is a kind of mauve/purple, which I think is a much nicer colour than the alternative pastel blue1. Zips, toggles, poppers and the lining are a contrasting creamy grey. Since the Velez is a smock you have a short main zip, which is one way, and backed by storm flap with a couple of poppers to secure it in place. The zip is a standard YKK plastic coil which is fitted in reverse, like all the others, with a metal runner. Coil zips are made from one length of a plastic string which is wound and formed into the zip. Pros are they are cheap to make and flexible, cons they don't tend to be as reliable as VISLON® zips assembled from individual pieces. Across the upper front of the smock is the signature kangaroo pocket. Love it or hate it! It's entirely functional and swallows a lot of bits and bobs, liner gloves, etc. Electronics and other things that must be kept dry I always put in plastic bags, I never rely on the jacket, or zips to be completely water or sweat-proof - none of them are. You also have two lower zips, these are two way with the upper runner having an extended puller. The lower runner just has a rubber button. The two lower runners allow the front to become a flap for enhanced ventilation. Lowering the upper zip runner you can slip your hands in through the holes so under the smock to keep them warm. There are two additional, internal, zips which it's said you can thread rucksack straps through to take pressure off the liner but I've never done this. The front of the smock is cut shorter than the back, more so than the old Velez, and the hem of the flap is plain. Around the back the hem is elasticated with adjusters either end to allow it to be cinched in at the waist. There are no 'keepers' for the end toggles to unless you make your adjustments and then cut the elastic, refitting the toggles, you get a dangling toggle bouncing around in an annoying manner. The fixed hood rolls away into the collar, which is not something I do generally, preferring to leave it out. It sits okay either way. The hood has the volume adjuster at the back, and the wired brim pulls down with adjusters at the front, enabling a good fit around the face. The hood moves with your head. Toggles on the end of the elastic are held away from the face by channels through the outer fabric to lessen the chance of being hit in the eye when out in a gale. However when it's all pulled into the face the elastic 'spare' is a bit too long and can smack you in the face anyway. A difficult compromise from the manufacturers when the hood is sized to fit a climbing helmet. The fit, unsurprisingly, is more feminine than my original but is not excessively tailored so it should be appropriate for most figures. Room across the shoulders is adequate for my relatively broad shoulders and the arm length is good. Hands up in the air don't result in cold wrists, or the smock riding up particularly. Wrist closures are Velcro® adjustable with a rubber bite pull. Arm volume is enough to allow the arms to be pulled up but not too excessive that it'll flap badly in wind. Given that the size S tends to be labelled a 10 in shops I would say that sizing is Páramo's relaxed fit, but don't automatically go down a size if you are ordering online as you may want room for a thin fleece under it. When it comes to windproofing, I'd say it is adequate for its purpose. It relies solely on the outer layer of fabric, which doesn't of course have a membrane to block the wind. Some will get through which is how it breathes. How waterproof is it, well, whilst I have yet to get it out in a downpour all day, the recent heavy showers it has been subjected to has beaded well and rolled off. 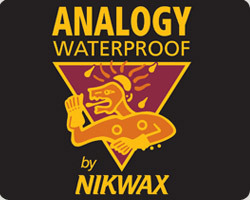 No water ingress anywhere. My overall impression of the Ladies' Velez Adventure Smock is a nicely fitting, functional mountain jacket that should last. For the avoidance of doubt, no-one gave me this smock for review so it can't be said I'm biased that way. If you go for the Marmite Theory, then yes, I do generally like Páramo jackets, but trousers not so much. 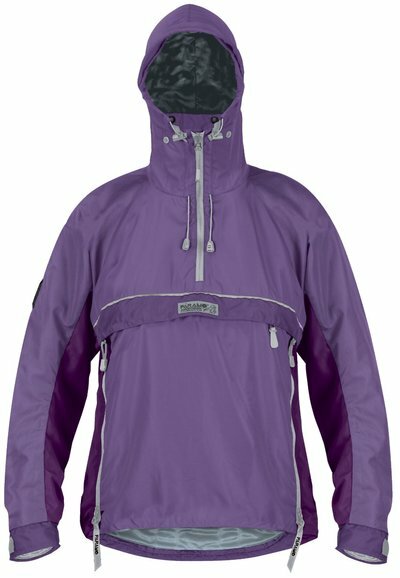 Páramo gear isn't cheap, and this jacket's list price is £225 but there's some reasonable deals on Amazon at the moment with prices from £159.20 - £225 in the two colours I saw it in, and also £180.39 - £200 in limited sizes and a different range of colours (so perhaps that's 2014 season stock)? Confusingly although the label in my jacket clearly says "Heath" on the Páramo web site they describe the colour as "Heather/Elderberry", sigh. Meanwhile the other colour, the pastel blue, is allegedly "Lavender/Cobalt".